PhD 1987, Electrical and Electronic Engineering Department, Nottingham University, UK. BSc 1983, Electrical and Electronic Engineering Department, Nottingham University, UK. A Level 1980, Tycoch College for Higher Education, Swansea, UK. Jordan General School Certificate, Tawjeehi, 1978, Grade: 93.2. 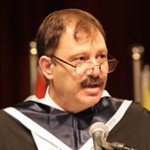 Full Professor, Communications Engineering Department, PSUT, 2000-present. Full Professor, Electrical Engineering Department, Mutah University, 1998-2000. Associate Professor, Electrical Engineering Department, Mutah University, 1992-1998. Assistant Professor, Electrical Engineering Department, Mutah University, 1987-1992. Vice President, Princess Sumaya University for Technology (PSUT), 2015-2017. Director of Center of South Studies for Development, Mutah University, 1999. Visiting Professor, Genoa University, Italy, July-August 2016. Visiting Professor, Sapienza University, Italy, July-August 2015. Visiting Professor, University of Barcelona, Spain, July-September 2013. Visiting Professor, University of Barcelona, Spain, July-September 2012. Visiting Professor, Royal Institute of Technology, KTH, Sweden, May 2006. Visiting Professor, Stuttgart University, Germany, June-August 2005. Visiting Professor, Sydney University, June-August, 2007. Australian Government Endeavour Executive Award, 2007. Erasmus Mundus Scholarships, 2012, 2013, 2015, 2016. DFG Grant, 2005 and 2008. Tempus Individual Mobility Grant, KTH, Sweden, May 2006. Challenges of Scientific Research in the Arab World, Al Rai Studies, 1998. Prospects for university education in Jordan, Al Rai Studies, 1999. Figures on the Sidelines of Arabs Future, Al Rai Studies, 1999. Mobile Phones in the Arab world, Al Rai Studies, 1997.